At this rate one will get the car in September. By then - there will be v8 available so it makes sense to pre-order and wait for 2020 GLE580 - but no one knows the specs. 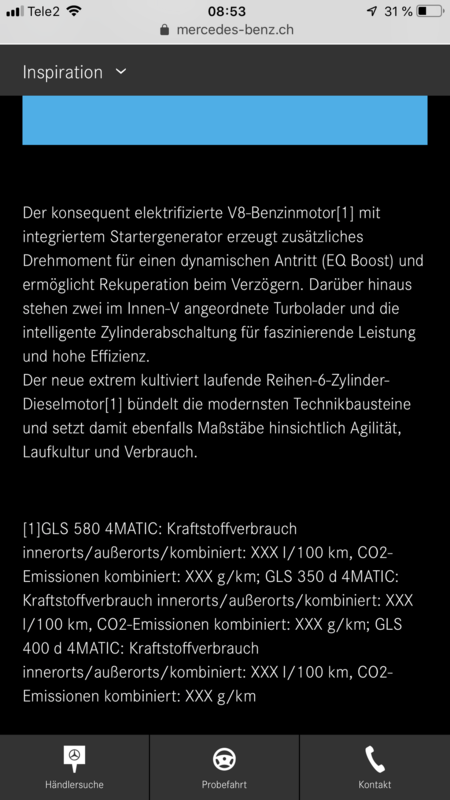 From GLS forums it looks like 470 HP - meaning it already loosing to x5 50 with 523 HP before it is even released. Any advise on ordering a loaded 450 with sooner delivery? It’s just a guess but I would bet 90 days is more realistic. Mine built 4 days early maybe because some were delayed. By now Mercedes should be close to reaching full production efficiency so timing would depend on the backlog. Make a deal to order with the deposit refundable and in a few weeks you should get an estimated build date. Some dealers are too optimistic and others are pessimistic. I would think that a dealer could look at some of their current order dates and projected build dates to give a realistic estimate. Anyone know build status B4-01.2 means ? My dealer told me my build been stuck on this status for passed two weeks. Did you order E-ABC? That would be my guess since others are also delayed. If the Dealer can’t tell you I doubt any Forum members would know. Greg has contacted MB, maybe he will get an explanation! Trying to order e-abc as well. Thank you for replies. Want to make sure it is not allocation issue. But the manufacturing issue. It sounds like the common denominator is E-ABC. One reason a lot of folks decided against E-ABC was the potential for maintenance related issues down the road from such a new complicated system. I wonder if anyone feels like this delay reinforces that decision/question? I think the other delay issue being thrown around is the interior assistant camera that monitors hand movements. I wonder if anyone is experiencing a delay with just the MBUX Tech Package (that contains the int assistant?) and not E-ABC? That answer might be provide insight as to whether later orders without E-ABC will be delayed. Mine was built last Friday and my build included the Interior Assistant. I may get a surprise but so far there was no notice of a change. I don’t know how soon the dealer gets details of my build but will try to find out tomorrow. Since Mercedes is tight lipped, the Rumor mill will continue. Ron yours is with E-ABC ? No just the Regular Air Suspension and I am wondering if that's why mine got pushed ahead 4-5 days. If there is some temporary shortage or other delay with the E-ABC then if those were held up it might explain mine building early. I had mine fairly well optioned. There a general factory delays across both GLE models this month - across all options packages - that is a different issue - and I have not personally seen E-ABC "emerge" from production yet which I think was scheduled "maybe" to startup late-April/early-May. "GLE560" - is factory term at the moment - "might" be late 3rd quarter production last discussion I was party to - and discussion was like "maybe" 300-500 as a "orphan yr/model" since there is another 2nd ECO-Boost powertrain on top of the I6 that is tentative 2Q 2020 production that cannot be named/discussed. V8 with cylinder shut down and EQ-boost! Great news Ron! Do you know if your dealer was invoiced yet? That usually happens a few days after it's built so it may have already been invoiced and shipped. The NetStar codes will tell the tale. Can't wait to see some pics. Fabbrisd1 so you mean MB is not making any GLE with E-ABC at the moment ? Should start production sometime later April. Just got informed by my dealer (in Canada) that MBUX Interior Assistant that I ordered is not available. Not sure if it is something worth waiting for, or is it a software feature that can be added later? Thanks Joe, I will check that out. That can’t be right or they wouldn’t have scheduled a bunch of them for build 2 weeks ago. Greg should hear something official soon from his Mercedes inquiry. IMO, they either found something that needed a change or the supplier of some part is at fault for one reason or another. They owe those of you that didn’t get a build on time an explanation and maybe a little something for your trouble. Supposedly my vehicle started production and was assigned a VIN on 2/21, almost 6 weeks ago and has been in status B4 the last few weeks! Production date was 3/13, 19 days ago. So, I contacted MBUSA Customer Assistance Center a week ago and have had a couple emails & calls since with no information. So after another call to CAC today I finally get hold of the "executive referral manager" (fancy title, huh), who only told me GLE production has been on hold pending parts and he is trying to get more information. He was clueless beyond that. Over the weekend I also got on my sales guy and the dealer sales manager. and told them they need to get on MBUSA, as well. Today I hear from my sales guy, who had called Distribution this morning and was told my order would be given "top priority" and should go B5 by the end of the week. He asked if my MBUX Tech Package or my designo trim selection was an issue and was told no. Apparently the sales manager also sent an email to Distribution and the West Coast Sales team explaining that a long time Mercedes customer was very unhappy and, what was going on? So, at this point I will believe it when I see it. I must say if Mercedes handles all orders like this when there are production issues they are going down in reputation fast (and I will help!). Why NetStar can't be updated with a realistic best guess production date when the original one is not met I don't know, but it hasn't been in my case. I'm trying to keep the faith. We ordered ours on 3/9 and were told at that time to probably expect it in early June. Checked with our sales consultant today who advised "Estimated production 3rd week of May. But the build just got finalized 3/31 because its customer sold priority so may have it sooner." My build did include the full MBUX Tech package including Interior Assistant. Good news, maybe the factory production is smoothing out. I ordered a car already built and the dealer said arriving soon. Now it has been almost two weeks and it is still in transportation. Did you order your car on 3/9 or your build date was 3/9....?? where are you located? Takes about 3 weeks to here in Oregon, after it ships.